This has a delightfully bright carmine red colour, giving the impression of a wine much younger than its 3 years, and there’s a bit of glass staining too. Not much nose, but what a deceptively inviting wine. Very soft and fruity on the front palate with a creamy middle backed with soft tannins. 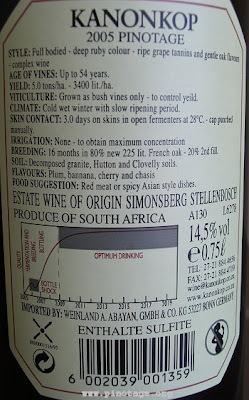 It is tad hot on the finish – I should have chilled it more; the label claims 15%abv although the factsheet from the Pinotage Top 10 (yes, it won in 2007) shows 13.57%. I think 15% is correct. As a city dweller I rarely experience total darkness or total quiet, or see more than a handful of stars. But on this trip to the Cape I enjoyed all three at Bon Cap in Robertson. Bon Cap is South Africa’s largest certified organic wine farm, and it is privately owned by the du Preeze family. Roelf du Preeze is the 6th generation to farm this land and he is never happier than when out in his beloved vineyards. Long concerned about misuse of the soil, Roelf converted to organic methods many years ago. Justification came when he saw the quality of the grapes he produced, and he then became increasingly unhappy to see his superior organic grapes going to the local co-operative where they were combined with all the rest. So he built a small winery, withdrew from the co-operative and started making his own wine. It is one thing to produce wine, but it needs to be sold if you want to eat and put shoes on your children’s feet. Luckily Roelf had had the good sense to marry Michelle, whose farming family roots go back as many generations. It was Michelle who packed her bags, bought an airline ticket and started travelling the world, attending shows and bending the ear of anyone who’d listen. 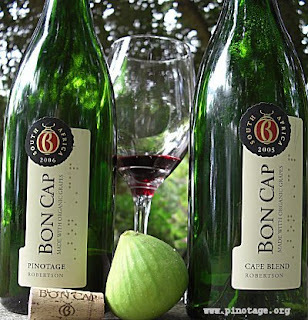 Bon Cap make two red Pinotages, one under the Bon Cap name and a second label ‘The Ruins’. “A lot of this is sold by the glass,” says Michelle. It also appears under the ‘Greenhouse’ label for Superquinn stores in Ireland and Booths in the UK. There is also a 100% Ruins Pinotage Rosé. “We’ve had huge demand for this,” says Michelle, “in one year we’ve almost doubled production to 8000 cases. But we’re going to reduce the proportion of Pinotage in our rosé so we can use it in our red wine.” And Michelle is very proud that the UK Wine Society have selected Bon Cap to be their supplier of own-label Pinotage. Michelle travelled the length of UK with The Wine Society last year, hosting tastings and meeting customers. 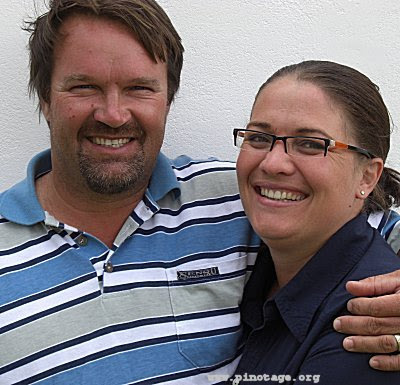 Also new this year is Marinus Potgieter (pictured right) who took over as winemaker in January. 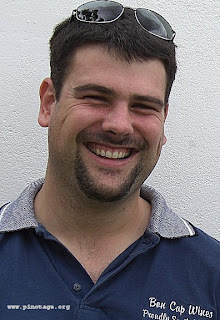 Marinus was previously three years at De Heuvel Estate in Tulbagh and is no stranger to Pinotage, winning four Young Wine Show trophies, including the CJ Petrow Trophy for the 2006 Champion Pinotage. front with soft blueberry fruits. 42% Pinotage, 33% Cabernet Sauvignon, 25% Petit Verdot. of complexity with a good structure and finish. And about those stars? Not content with travelling the world marketing Bon Cap, managing the farm bistro, organising weddings in the farm chapel, doing the catering, and bringing up a young family, Michelle also manages guest cottages clustered around the farm lake. And it was in the appropriately named ‘Pinotage’ cottage that I spent a couple of nights. Bon Cap is in a valley on the banks of the Breede River. The nearest main road is the R60 between Worcester and Robertson; the turn-off is a gravel track that winds over desert hills for seven kilometres before reaching the peaceful green oasis that is Bon Cap. Night time at Bon Cap is quiet and dark – completely and utterly velvetly black. Looking out the window of our little cottage we could see no light at all. But step outside and it seems the heavens are pressing down on you, for they are packed with an infinite number of piercing bright stars sparkling like diamonds in a spotlight. 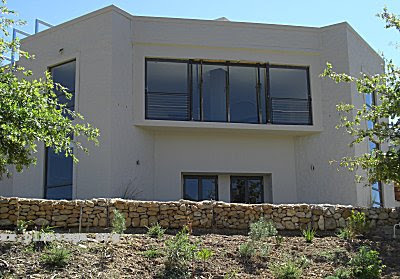 If you want to visit wineries in the Robertson area, or to get away from it all, or to just rest, relax, breathe fresh air, eat good home cooking, and drink great wines, then staying at Bon Cap won’t disappoint. Decades ago I went hill trekking in the Golden Triangle of northern Thailand, up along the Mehkong River by the border with Laos. I slept in tribal villages of various indigenous peoples; not Thai but Akah, Lisu, Hmong and more who have no states of their own nor recognition of national borders. The triangle is golden because thick jungle hide clearings planted with marijuana and poppies for heroin, protected by warlord ‘generals’ and their barefooted but uniformed and heavily armed soldiers. Those memories return every time I place a bottle of Stellenzicht Golden Triangle Pinotage on my table — which unfortunately is not often enough because it is rather difficult to obtain. 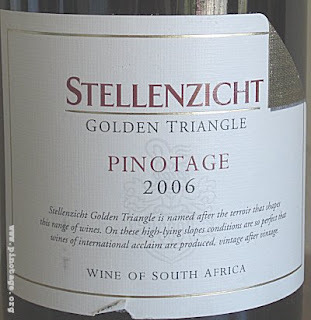 Stellenzicht’s triangle is golden both because of the quality grapes grown in the valley, and because of Guy Webber. I would like to say that he is at his winemaking peak, but that would imply he can go no further and I don’t think he has any limits where winemaking is concerned. There is the most beautiful fruity and floral perfume coming from this medium red coloured wine. I had to pause and enjoy it. The first taste gives sweet redcurrants followed by hints of coffee, lavender and maybe some elderflower. I was surprised to see the label shows 15% abv because this wine doesn’t taste like a big alcohol bruiser. Rather it is as lithe and sinewy as a Thai temple dancer, perfectly balancing rich fruit flavours with acids and tannins. This wine is just so moreishly drinkable – and all too soon - it was drunk. Regular readers of this blog will have noticed several comments posted by the mysterious ‘Liberty’ of Juno Wines (left). When I said I was coming to the Cape, Liberty commented that I must visit and taste their Pinotage Rosé. So on one baking hot day last week, I did. Juno’s office is in a 1793 building situated on Main Street, Paarl. Juno wines are noted for their attractive labels featuring juno-esque women painted by Tertia du Toit. Many wines have artistic labels, but I’ll bet Juno are the only one with the artist in residence, with her studio and art gallery sharing the same space. The outside temperature was 37˚C, so I was doubly pleased to enter the cool building and to be offered a chilled glass of Juno 2007 Pinotage Rosé by Liberty herself. The wine is an attractive pale salmon pink colour and tastes dry, although it said to be off-dry with 7.5g/L of residual sugar. I found it light bodied, with very gentle strawberry flavours and a hint of spice. Liberty says it reminds her of strawberries which have had black pepper ground over them, a dish popular in the Cape. It comes from 15 year old vines grown in the Robertson area, is made by Néwald Marias, has a friendly 12.24% abv and costs and even more friendly R25 (£2/$4). And what about a red Pinotage? Liberty says Juno will be adding more wines to their range and that it was a possibility. 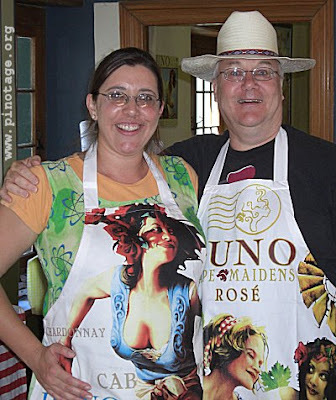 There was one more thing to do, and that was to have a picture with the lovely Liberty and, since she was wearing an apron with Tertia du Toit’s painting of Liberty, I too donned an appropriate Juno apron adorned with the picture that appears on Juno’s Pinotage Rosé. Juno wines, artistic aprons and Tertia du Toit’s wonderful prints and paintings are all available at 191 Main Street Paarl, or via the website at http://www.junowines.com/. And read Liberty’s blog – there’s a link on the right. Pinotage is, as any fule kno, the result of an arranged marriage between noble, shy, delicate Pinot Noir and a rough diamond called Cinsaut. Some 80 years after its conception, winemaker Conrad Vlok has claimed a world first by putting both parents and offspring together in one bottle. 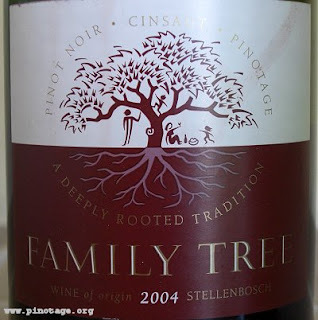 Family Tree 2004 is a blend of 38% Pinot Noir, 34% Cinsaut and 28% Pinotage. They say Pinotage overwhelms a blend and I’d expected fragile Pinot Noir to be lost, but this wine smells of it – “is this Burgundy?” my partner asked me when I poured her a glass. Unlikely when we’re here in the Cape wine-lands for me to taste primarily Pinotage, but I had told her I was giving her one night off my favourite variety. So what did we get? A good clear bright red colour, a burgundian nose, a bit green and vegetal. Light bodied and austere with some strawberry flavours but a sour finish. I’m not sure if it is supposed to be like this, or has passed its best (it’s now four years old), but my bell remained un-rung. I would have appreciated some of that Pinotage sweetness. But we did enjoy the poetic back label. 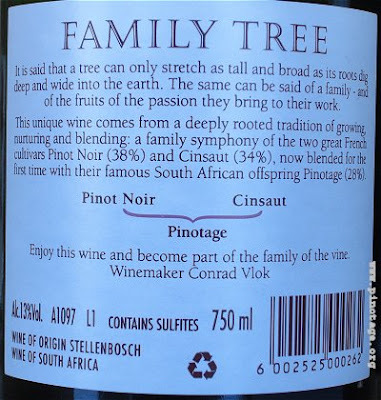 I know nothing about Family Tree, and find no mention of it in Platter but I did meet Conrad Vlok once some years ago when he was winemaker at Delheim and I know he has a skill with Pinotage. He is now at Strandvlei Vineyards in Elim, responsible for the First Sighting range, whose knockout Sauvignon Blancs are in my local Morrisons, and maybe this is a personal venture. Last year Beyers Truter announced he was going to produce a blend of these same three varieties. I don’t think he’ll need any encouragement, but don’t stint on the Pinotage, Beyers. *that she has never heard of. 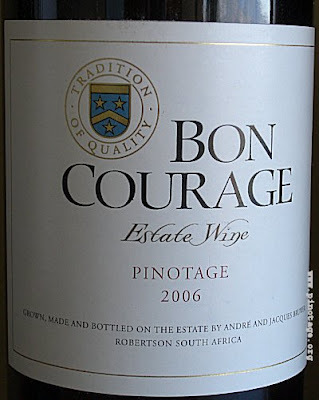 My initial impression of Longridge's 2004 Pinotage is of ripe red plums, but underneath the immediately attractive fruit is a serious wine with a good structure and some wood tannins. The back label suggests enjoying this wine from 2011 till 2016. Call me impetuous, but I couldn’t wait and I enjoyed it last night with a sirloin steak. Drink it cool now or keep aging it; the choice is yours. I've had several very nice Longridge's, but for some reason this is a winery under my radar, probably because I don't see it in my local wine stores. But if you do see it, don't pass by. Remarkably sweet nose and initial sweet taste. Lots and lots of ripe mulberry fruits with soft vanilla (American Oak??) creaminess in the middle and black olives on the finish. This is a delightful crowd pleaser which we couldn’t resist drinking on its own as we waited for our steaks to arrive. There’s enough body, but as the bottle nears its end some doubts set in. I can see why it so charmed the judges of the 2007 Top 10 because the first glass is a stunner of sheer upfront approachability. But I found it became tiring to drink. By the third glass the sweetness palls. I found it too jammy and too soft for continued pleasurable drinking with food. The American term ‘fruit bomb’ seems appropriate. But, boy, I did so enjoy that first glass. I went looking for Stormhoek’s Winery, and it wasn’t what I expected. 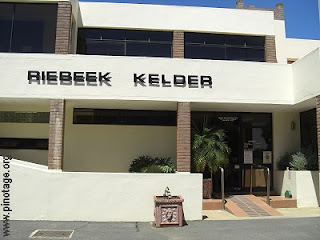 The South African winery that is one of the most talked about on the web, whose Pinotage won the International Wine & Spirit Competition Trophy, whose wines grace the shelves of all the major UK supermarkets and wine shops, are distributed in the USA and Europe and on the business class wine lists of international airlines and restaurants around the world, doesn’t really exist. Well, not in the way I expected. I visualised a modern shiny winery building with smartly dressed receptionists, surrounded by vineyards, accessed by a wide road for the constant flow of trucks bringing in grapes and shipping out pallets of wine destined for the four corners of the world. My directions led me through the town of Wellington, down into a valley along a dead-end narrow road which turned into a mud track. The track got bumpier and narrower. “I can’t see a fleet of trucks loaded with cases of wine navigating this,” I thought and turned around till I got a cell-phone signal and checked with Stormhoek’s Shane Walton who provided my directions. He sent me back down that track with instructions to keep going till I saw a Stormhoek sign. So down it I went until in an oak forest a small sign pointed up an almost vertical track up a wooded hill. The track was riven with deep grooves gouged by rain and the car jerked and grinded till finally it came to an end at a low old building. Sitting on its veranda was Graham Knox, the driving force behind Stormhoek. He immediately gave me new directions back to Wellington where newly picked Pinotage were being delivered. The directions led to what looked like an abandoned warehouse behind a rusty chainlink fence next to the railway line. No sign of life, except for a small red car. Another phone call and I found that the padlocked gate could be opened, and once through the fence I found an open door into the warehouse. 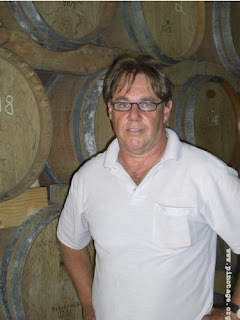 Inside were barrels and Stormhoek’s winemaker, Koos Bosman (pictured above). Within moments a beat-up old pick-up truck towing a trailer loaded with plastic boxes full of purple pinotage grapes backed into the warehouse. 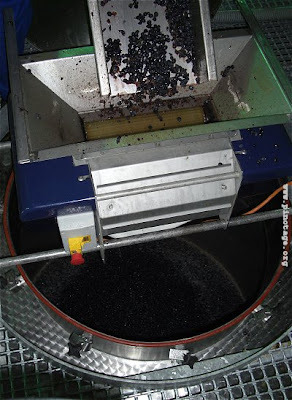 Koos discarded bunches with unripe grapes and the rest were tipped into a destemmer. “I am working the entire winery off two electric sockets,” Koos told me. They had just moved to these premises and the power supply didn’t match what they expected. These grapes came from a block next to Graham Knox’s hillside house. 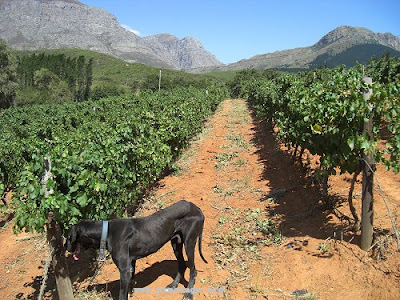 They and the other grapes grown in Graham’s vineyards would be made in this winery and bottled as Stormhoek’s premium range. They are small quantity wines made very much in a garageist manner, with low technology, and long barrel aging. Back up that dirt track, Graham Knox opened the current 2004 vintage of the wine I had seen being made. It is called ‘The Guava’ Pinotage because the vineyard had been previously planted with guavas, some of which still remain in a corner. Graham’s vineyards, planted on red clay and shale, get progressively steeper and the higher vine rows are planted on terraces. front palate leading to a creamy middle. Tremendous fruit with sweet berries and a lick of coffee. The wine had spent 2 years in new oak, 70% French and 30% American. 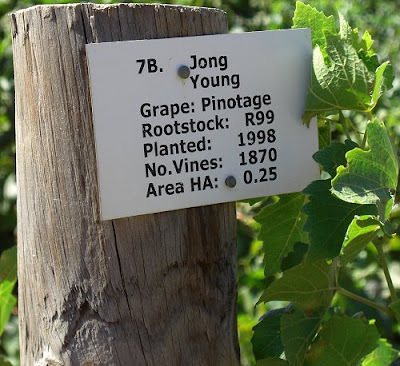 (Koos had told me at the winery that he thought American oak suited Pinotage). I thought this wine was superb, and drank far more of it than perhaps wise. 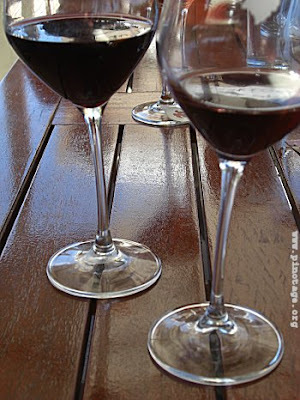 Prior to the Guava Graham poured the standard Stormhoek 2006 and 2005 Pinotages. The 2006 had really plumy fruits and was inviting and very drinkable. The 2005 was a bit funky on the nose, and delivered blackberry fruits. A bit more restrained. The standard Stormhoeks come from Wellington fruit, not from Graham’s own vineyards, but from other growers blocks that he has selected. Koos Bosman makes samples of wines to show to potential buyers. 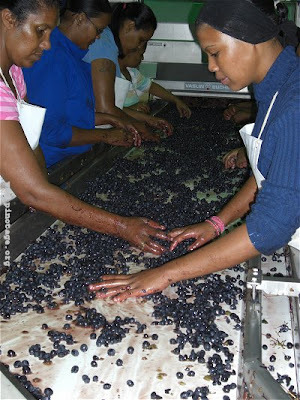 When Stormhoek have an order, they then source the fruit or wines and make and blend them to Stormhoek’s standard. They have inverted the usual winery practise: instead of making wines and then trying to sell them, they only make wines when they have a customer for them. 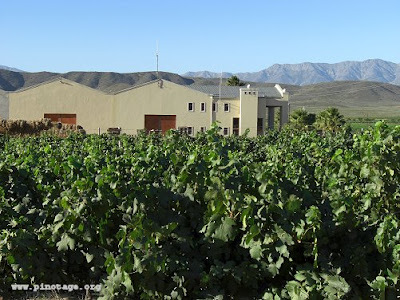 They don’t use the small scale warehouse winery for the large volume wines, instead they rent facilities at the nearby modern Bovlei co-operative winery. “Stormhoek is a virtual winery,” Graham told me. As to the future, it is early days how the relationship with Origin Wines will work. Origin bought the assets of Stormhoek’s UK partner Orbital Wines. Those assets include the Stormhoek brand name in the UK. Graham is keen to get Stormhoek back on all the UK supermarket shelves. There’s a new chef at Beyerskloof Winery’s Red Leaf restaurant, and an extended menu with a good crown of lamb and huge chicken salad. But the Pinotage Burger is still a fixture, which is what I had been waiting for 12 months to eat one. There is a front page story in a local newspaper here in the Cape complaining about the high mark-up on wines sold in winery restaurants. But wine in at Beyerskloof’s restaurant is priced the same as in the cellar shop. This time last year I was drinking the just released 2006 standard ‘white label’ Pinotage, a wine I went on to buy several cases of at home. So I was keen to see if the 2007 vintage topped that, however it is not yet available. So instead we had two wines from Beyerskloof’s library wine list. The first ‘white-label’ Pinotage from 1995 and the first Synergy Cape Blend from 2001. These are both priced at R225 (about £17/$32). And you know they have been stored in absolutely perfect conditions in the cool cellar underneath the restaurant. Both wines were kept chilled in ice-buckets, essential in the 30 degree heat of a South Africa lunch time when you’re sitting outside on the veranda overlooking vineyards. 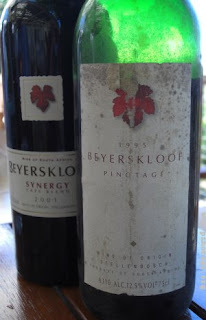 The 13 year old Beyerskloof Pinotage was a revelation. Pale bricking red, light bodied with lots of sediment staining the sides of the bottle. It tastes like an aged Bordeaux but with a bit more fruit. It was light, (12.5% alcohol), and elegant, definitely showing signs of age, a fascinating drink. The 2001 Synergy is a blend of Pinotage, Cabernet Sauvignon and Merlot. This seemed a mere youngster alongside the 1995 Pinotage, and fruit was to the forefront. But ageing had smoothed out some of its ebullience, and softened tannins to make an extraordinarily classical European style wine. They didn’t produce much of these old wines, and probably the only opportunity you’ll have to aquire them is at the winery, so don’t shake them up and boil them in the back of your car, but drink them there in the restaurant. It won’t cost you any more. Boplaas Winery are calling on jumbo sized assistance in pressing their 2008 vintage. An elephant from Knysna Elephant Park will be stomping some grapes to be used in Boplaas’s Elephant range of wines, reports the Cape Times. Like most good ideas, it came to owner Karel Nel over a few glasses of wine with his friend Ian Withers who happens to own the elephant park. Proceeds from sales of the wine will go to aid conservation. Yesterday I took a brief drive up the R44 to visit L’Avenir and Kanonkop. L’Avenir acquired neighbouring vineyards of the defunct Sentinel, and with it the ‘castle’ which was re-opened last week as the new tasting room for L’Avenir (above). Gone are the turrets, battlements and historic cannons. In their place is a thoroughly modern corporate tasting room with leather benches, standing tables and logo emblazoned spittoons. I’m an old romantic, and no matter the warmth of the greeting from the lady in the tasting room, this place felt heartless after the tasting corner in L’Avenir’s working winery barrel cellar. I tasted the standard L’Avenir Pinotage 2006 which was an impressive dark purple colour with attractive sweet fruit on the approach followed by red berries but a tart finish. I asked, and was told the bottle had been opened the previous afternoon, some 24 hours previously. I don’t open my wines a day before drinking and I wondered if the sharpness was an effect of such long opening in a warm climate. This wine retails at the cellar for 120 Rand, (about £9.60/$20). Also open for tasting was the Grand Vin Pinotage 2005 at a whopping 250 rand or (£20/$40). This had a dark red colour and was powerful yet sweetly fruity. Some nice spice in the middle, but let down by a sharply tart finish. Opened too long? A bit further along the R44 a cannon still marks the entrance to Kanonkop Estate. 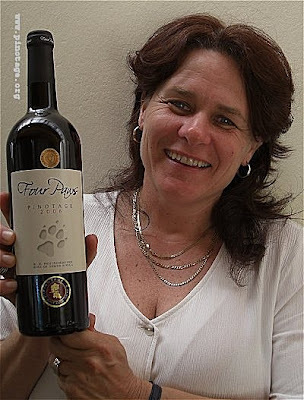 I wanted to taste their 2005 Pinotage (140 Rand - £11.20/$22.40) which is now available – I had last tasted it a year ago. It was bottled in July ’06 and bottle-matured in their cellars until ready for release at the end of 2007. This wine tastes so soft; it is one of the softest Kanonkop’s I can recall. But in the fruity body there is a structural spine of finely tuned tannins down the middle followed by cleansing acids on the finish. It reminded me a lot of the 1999 vintage that was also very drinkable when young – so much so that I drank all mine shortly after purchase and then discovered on re-tasting it at the winery last year that it was even better with age. A mistake I will not make with the deliciously approachable 2004 of which I have bought prodigious amounts to drink and to keep, and now I must also plan on making room for some 2005’s when they finally appear on the UK market. 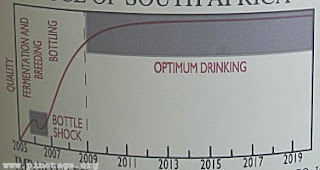 I happened to see winemaker Abrie Bruwer in the tasting room and he told me Kanonkop had always intended to make wines that would age – hence the back label maturation chart. But modern viticultural practises and innovations -- such as the grape sorting table which allowed the removal of stalks and unripe grapes --enabled them to make a wine easier to drink young yet still capable of long aging. 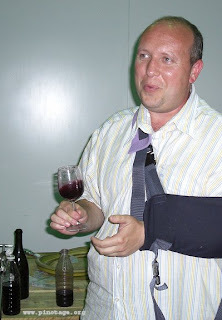 Of this 2005 vintage Abrie said he tasted a ‘tomato cocktail’ with lots of red berries. I wonder how much longer Kanonkop will be able to show the maturation chart. There is no room for it on labels for sale in the USA; the Surgeon Generals's mandatory fatuous warning takes its space. The label pictured has recycling logos, plus the nonsensical French pregnancy sign. There is increasing pressure for more information and warning messages to legally required. UK Trade magazine Harpers report today that South African company Origin Wines has taken over the assets of the failed Orbital Wines. Those assets include the UK rights to the Stormhoek. In other words, they are not taking over Orbital and its staff. 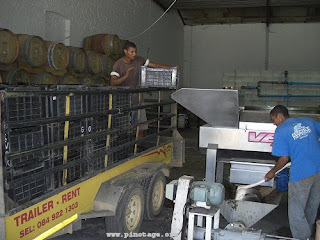 Two weeks ago I posted a picture of Delheim’s first Pinotage grapes being harvested. 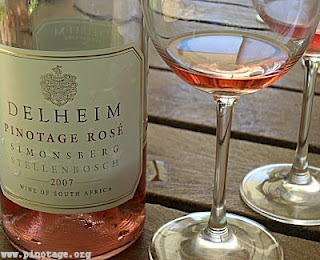 They were pressed to make Delheim’s popular Rosé and yesterday lunchtime I tasted the work in progress. It was a neon pink colour and smelt of bread and pear drops. Fermentation hadn’t completely finished and it had yet to be fined, which accounted for its yeastiness being clouded. This was very dry, with just 2 grammes per litre of residual sugar. 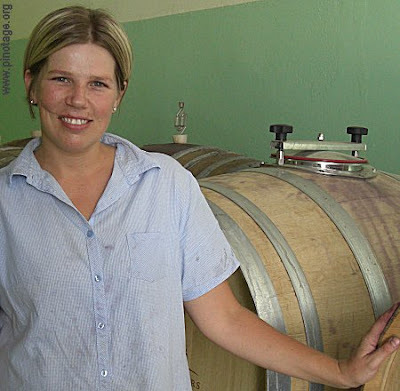 Delheim’s winemaker, Brenda van Niekerk, will soon blend in a tiny amount of Muscat de Frontignac to round out the wine and sweeten its edges. But it was showing great promise and was right on track to follow the lineage of the 2007 Rosé. The lunch menu changes monthly and as usual I was torn between choices. I picked Ostrich Bobotie with rice and home made chutney. The bobotie was cooked in an individual serving dish and really scrumptious – moist with a risen egg custard on top and aromatic spices and almond slivers flavouring the meat . Next time I will have the Cape Malay chicken curry wrapped in a filo pastry parcel which my companion praised, or will I have oxtail cooked in Shiraz or lamb shanks cooked in Merlot? This year’s open weekend at Beaumont Winery was sadly missing its star. Raoul Beaumont, owner and patriarch, passed away after a short sudden illness exactly a month before at the start of January. Raoul would have loved the event. 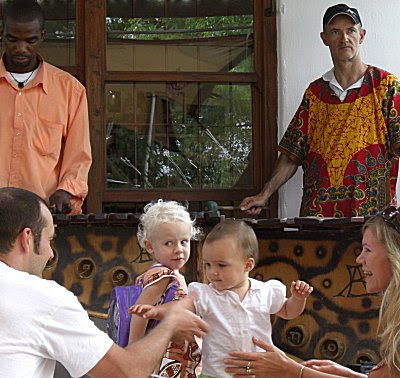 A wonderful band playing traditional African wooden xylophones (pictured above) kept up a non-stop tuneful rhythm and olives, dips, cheeses and bread were available to graze on. The lawns were full of picnickers and kids were splashing around in the lake. Winemaker Sebastian Beaumont was everywhere, pouring wine and chatting to guests. 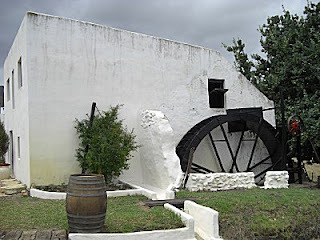 And the old mill was working again for the first time in more than forty years stone grinding flour that was being sold at 20 Rands per kilo bag as fast as it could be produced. Although the mill was derelict when the Beaumonts bought the farm, they kept the equipment together and the building in good repair. Then last year engineering enthusiast Andy Selfe, visiting the farm on an organised tour, recognised the mills potential and offered to restore it to working condition. The Beaumonts readily agreed. It took Andy just four weekends of putting the old equipment back together, adjusting screws, and greasing moving parts before it was working. The mill building, which dates back to around 1800, is unusual because it contains three mill machines. The first is driven by water, however the wooden gulleys that carried water to the millwheel had rotted away long ago. But the mill was also equipped to be operated by an engine during drought conditions, so Andy Selfe brought his 1939 engine to power the leather belt system that drives the using 1920’s Stamford mill. He has also restored a 1900 Guttman portable mill to working condition and is now working on bringing the original water wheel back into production. Visitors clustered around him as he explained the mechanisms and demonstrated turning grain into flour. 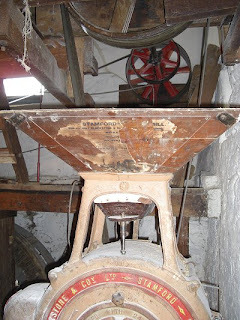 The stone wheels that grind the grain would have been recognised by the ancients – the grooves scored into them are spaced identically to 2000 year old Roman mill stones – and the Greeks before them were using water wheels. But they would have been amazed by the sturdy engine that turned the wheels without the need for human, animal, or water power. But what about the wine, you are no doubt asking. 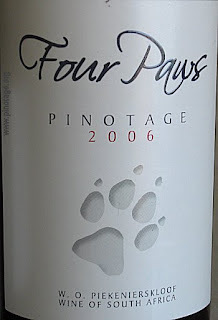 Beaumont’s 2004 Pinotage was available for tasting. Although aged, it is still sturdy with some firm tannins fronted by dark berry fruit flavours and great with a steak. Beaumont are really on the ball -- their website already has three pages of photo's from the open days, and read their blog for Andy Selfe's report on restoring the mill.